On Saturday December 13th Trombone Shorty will perform at the Newport Music Hall in a jazz-funk frenzy with his band Orleans Avenue; consisting of Dan Oestreicher on baritone sax, Pete Murano playing guitar, Joey Peebles on the drums, and Mike Ballard playing bass. Opening the stage that night will be The Soul Rebels, a brass band and a fellow New Orleans-based group. 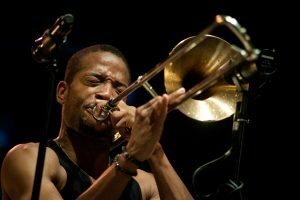 Troy Andrews, better known as Trombone Shorty, was on the New Orleans jazz scene as a professional bandleader by the age of six, and had a local club named Trombone Shorts in his honor by the age of eight. Though he had already toured internationally by the time he was 12, his talent for the trombone was honed in high school when Andrews was accepted into the famed musical education program at the New Orleans Center for the Creative Arts. In 2002 Andrews released Trombone Shorty’s Swingin’ Gate as his first recording under his own name and over the next few years he released several other recordings, including four Live at Jazz Fest albums. Andrews toured the world again in 2005, as a 19 year old, after he was chosen to play in the horn section of Lenny Kravitz’ band. Starting with Backatown in 2010, Trombone Shorty released three albums with Verve recordings over the next four years, all while continuing to tour and make guest appearances on various albums. Upon its release, Backatown spent nine weeks in the number one spot on the Billboard jazz chart and was nominated for a Grammy Award. Andrews followed up by releasing For True in 2011, which spent twelve weeks as number one on Billboard, and then in September 2013 came his latest work Say That To Say This. Tickets are available at the box office or on Ticketmaster’s website.